In Love With Dickens sees Miriam Margoyles read as Mrs Gamp from 'The Life and Adventures of Martin Chuzzlewit'. Steve Evets also joins her in paying homage to the great Victorian novelist's last picaresque work, portraying the story's aging and devoted clerk Mr Chuffey. 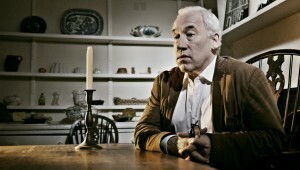 Actor Simon Callow chooses to read the passage depicting Scrooge’s first visit from Marley's ghost in the festive tale 'A Christmas Carol', and Thomas Brodie-Sangster performs Pip’s first encounter with Miss Havisham from 'Great Expectations'. Meanwhile, rising star Douglas Booth, plays Mr Peggotty's kind-natured nephew Ham in 'David Copperfield'. Alex Werner provides context throughout. 8pm start.